your answers here however, please feel free to drop us an email and we would be happy to help you in any way we can. 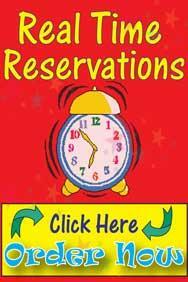 How do I go about reserving your event planning services or party rental equiptment from you? moonwalk / bouncer. If you're not sure what size your yard is, you can measure it or "walk it off" heel to toe in a man's shoe (it'll be about 1 foot per step) to approximate. If you can imagine two parked cars side by side in your set up area, most likely we can fit the unit in that area. Don't forget your vertical clearance! You'll need an area free of low wires and branches, about 16-17 feet high. A standard walk through gate is fine. We bring the unit rolled up and wheel it in on a standard hand truck (dolly). If a person can comfortably walk through, we can fit the bouncer through too! rules with you prior to use. While no one can guarantee safety, we do everything we can to promote safe use of our products to ensure your day is filled with fun. Pricing is subject to change at any time. We try to keep our prices as reasonable as possible. For current pricing, check out our list of inflatable products page. Yes. 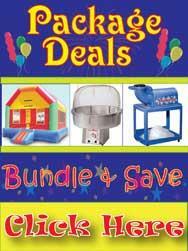 All of Have a Ball Party Rental Equipment is thoroughly cleaned between each use. In addition to cleaning, we also safety check and troubleshoot all equipment before it goes out to each client. This way, you are always guaranteed a unit that is safe, clean and in good working order. concern. If your event may be cancelled due to weather, you will be called 2 hours in advance. You may cancel at this time and receive a refund of your deposit. If there is a 50% chance of rain and you deceide to move forward with the rental and it rains, you will not receive a refund of your deposit and/or your rental. Please see our Refund Policy fo more information. located within our 15 mile radius. Yes we do! The Atlanta Metro area offers many beautiful parks for parties and special occasions. You will need to verify in advance though, whether the parks have any limitations on inflatables and make sure power is available and is within 75' of your proposed location. No problem. We can also provide a small power generator to run the blower for your moonwalk. area. The blower runs continuously and uses approximately $0.14 of electricity per hour. Your blow dryer uses more than that! NOTE: All blowers and wiring are safety checked before delivery. You decide on the specific time you want the bouncer set up by and we'll have the equipment set up between 30 minutes and 2 hours before that start time. 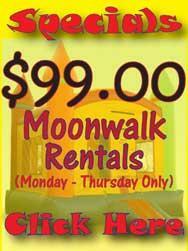 Also, you do not pay for our set up time, all rental periods are jumping time only! Pick up is based on the number of hours you rent for. If you have special requirements for an exact setup or pick up time, (for example, your event is in a location that you have rented for a specific amount of time) let us know. booked on a first come first served basis. Q: I would like to rent concession equipment. Will you provide the supplies necessary for each rental? A: This will vary depending on the concession equipment rented. Please ask us for details. A: Most of our jumps are 15´x15´ which is a little bigger than many companies rent. Please note the space required for each jump (listed near the large picture) as some are VERY big and require extra space. When in doubt, measure your space to make sure it will fit. Jumps need room to be staked and they need room for the blower and can´t rub against walls or trees as this may damage the jump. The sizes listed with each jump include the space needed for stakes etc. If you have stairs or a tiered backyard, please call our office to discuss options for setup.